Soak 3/4 cup uncooked rajma beans in (2-3 cups) water overnight, and in the morning drain all the water, and pressure cook these beans (which now will have increased in size) with 2 cups of fresh water, for 4-5 whistles. And then set this cooked rajma aside, without draining the water this time, as we’ll need it for the curry. Note: The number of whistles will depend on the kind of pressure cooker you are using, and some don’t even have whistles these days. So boil/pressure cook rajma till it gets soft and mushy when pressed but otherwise still holds form. Now, in a pan heat up 3 tbsp oil, and add the chopped onions and 1 tsp salt, and saute till the onions turn light golden brown. Then add in the ginger garlic paste, and saute for 2-3 minutes till the paste gets lightly cooked. Once this is done, add in the spice powders – rajma masala powder, along with chili, coriander, cumin, garam masala powders, and sprinkle some water (if required) to avoid the masalas from burning. Saute the masalas for 2-3 minutes till you can see the mix leave oil from the sides, and then add in the chopped tomatoes, mix well and saute for 5-10 (depending on your preference) more minutes on a low flame. Note: Some people I know don’t cook tomatoes all that much, but I love the flavor when I saute the tomatoes for those extra few minutes on a low flame. Once this is done, let this onion tomato spice mix cool for a bit, and then it’s time to puree this in a mixie, along with 1/2 cup water, and 2 tbsp cooked rajma beans (from the cooked beans that we set aside earlier), till you get a smooth paste like consistency. Note: Adding the rajma beans in the mixie is optional, but this is something I picked up from my mom, that I always do. Especially whenever I am making curries using the different types of beans. I always add a little of whichever beans I am using in the masala puree to kind of “marry” the curry with the beans, so that it all comes together better. It also makes the curry more creamier. Once the puree is ready, pour it into a pan, along with the rest of the boiled rajma beans, and the water we retained. Then add in 1 more cup of fresh water, and mix everything well, and bring it to boil. At this point, also taste for salt, to see if you need to add more, and adjust accordingly. Finally, add in 1/3rd cup chopped coriander leaves, and 1 tsp crushed kasoori methi flakes (optional but highly recommended), and cook for 5 more minutes on a low flame. The Rajma/ Kidney Bean Curry is now ready to serve with roti/naan/rice. Pro Tip: This is a good dish to make ahead, as it is one of those things that taste better the next day after it is made, once the rajma beans get a chance to sit in the curry and absorb all the flavorful spices. 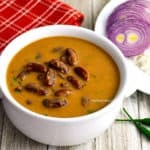 If you have forgotten to soak rajma beans overnight, and need to make this dish relatively quickly, you can soak the uncooked rajma beans in hot boiling water for 2 hours & then pressure cook & proceed as normal. This will work in a pinch. In this recipe, I have pureed the onion tomato base, but you can choose to not do that. Some prefer the more chunkier texture of chopped onions & tomatoes in their curry. Some others even grate in the onion, and use tomato puree. So you can adapt this to your preferences. Speaking of preferences, you can adjust the consistency of the curry to your liking too. Some like the curry thick & chunky to go with their rotis, and some like a relatively thin curry to go with rice. I personally prefer a curry that is neither too thick & chunky nor too liquid-y. Which is why, this recipe makes a curry that has a rich & thick masala base that will taste good with naan, but is liquid-y enough to go with rice too. Finally, remember to adjust the level of spice to suit your taste buds, as the overall level of spice of the curry depends on the sourness of the tomatoes to some extent. So adjust the amount of chili powder accordingly.